In addition, thre is equipment from Rusmar-a company that supplies foam technology to land fills and Superfund sites-this is not reassuring. In some ways, it is reassuring. At least, they are dealing with it. It might impact construction timeline, but a contaminated site is being cleaned and developed. A landmark in the making? Last edited by antinimby; December 3rd, 2005 at 11:22 PM. Keep an open mind. Besides, I'm just happy it's not another brick box. I am not demanding brick boxes (although some of those can be quite nice). Richard Meier's three West Street buildings, for example, are glassy modern constructions, but utterly elegant all the same. This looks like a clay mold. I'm not exactly that enthusiastic either. The West Side Highway is starting to look a little too much like Miami Beach. It is been since October 14, 2003 that the first story anouncement for this project was posted on page 1. This one better look totally amazing when finished. 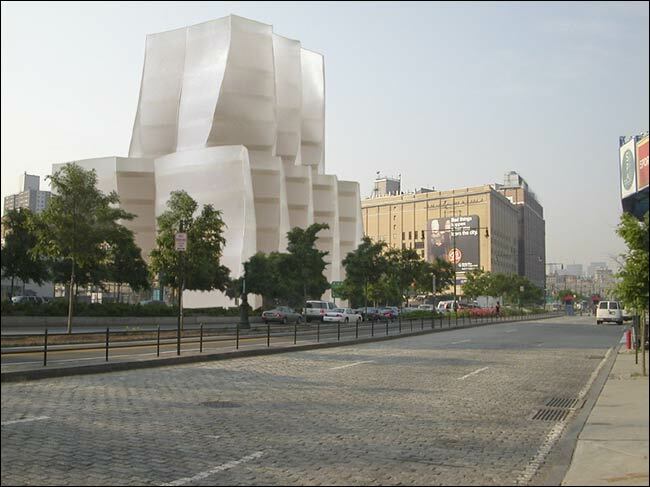 Now Gehry has plans close by this building for 2 new residential buildings. It is been since October 14, 2003 that the first story anouncement for this project was posted on page 1. This looks like a clay mold. It's an unrefined model "photoshopped" onto a real scene. It only shows the form in context. Where exactly is it located again?